What is a Plasma Display? How it works Plasma and Display Information. Plasma Display Rentals are one our specialties here at expos4products and we have hundreds of different Plasma Screens for rent in a variety of sizes and brands. Plasma Stands, Speakers and variety of other AV and computer equipment are available to meet any of your business and tradeshow rental needs. We will help you connect your laptop computer to your Plasma Display to give a larger screen for your presentation, show a DVD video, or grab the attention of new customers and clients with your PowerPoint slideshow of your products. Our sales staff can help you pick a Plasma or LCD Display that meets your needs along with speakers, stands or any other equipment you might need. We will deliver Nationwide and have 24x7 tech support to make sure every aspect of renting one of our Plasmas monitors exceeds your expatiations. Call 503-477-8972 today or Express Quote Request to get started on your Plasma or LCD Display Rental today. 100 inch LCD Large Screen Displays, Plasma Stands, Cobra Stands. 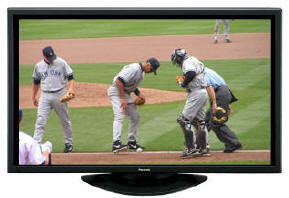 Rent 1080p NEC Multeos M40-AV 40"
136 inch LCD Large Screen Displays, Plasma Stands, Cobra Stands. The top 5 reasons to go 1080p and what it is. Make sure you have the right sound system and cables. To the right, our standard dual post floor stand designed to be used with 2 plasma displays. The dual 2" chrome posts allow for height adjustability with (average is 5 ft. in height center . Takes up the same space within your booth but you get twice the information and product views displayed. Optional flat accessory shelf installed above or below the display in a front or rear-facing mode for DVD player or laptop computer. 42 Inch NEC or Panasonic With 1024 x 768 XGA resolution, Advanced AccuBlend Technology and a 3-2 pull down converter ensure the best possible brightness, contrast, color and image quality from any source. Realistic color reproduction via NEC's exclusive Capsulated Color Filter Technology is now enhanced by AccuCrimson, a filtration technology that produces the purest shade of red yet possible in a plasma display. VGA to UXGA in both 16:9 and 4:3 aspect ratios Dimensions 40.1"x 24"x3.5"
If you need sound with your video, consider adding a pair of powered speakers to your plasma rental. We carry many different types of speakers along with the factory side mounted audio system, this is sure to make your sound as perfect as your images. 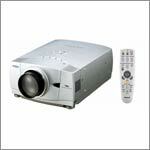 You can display computer images, video game consoles, live DV camera, and DVD/VCR feeds. The number of input feeds varies by make and model so be sure to enquire about which best fits your needs. Why all the hoopla about 1080p? Most early adopters saw no improvement from their "up-converting" DVD players, even after going digital with HDMI™. Why? Because all they were really seeing was enhanced 480p on a 1080i display. The early hype about 1080p made us think it was the next big thing. Is it? New HDTVs that are "full HD 1080p" are shipping now so let's take a look at the top 5 reasons to go 1080p. 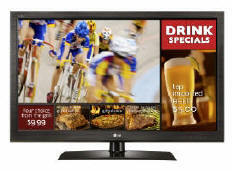 Plasma screen TVs have had some bad publicity thanks to the ignorance of some salespeople at national retail stores. This page is dedicated to giving you the true facts about plasma burn, so you can make your own choice about buying a plasma TV screen. About plasma screen pixel burn-in and dead pixels? A lot of people worry about pixel burn-in when researching Plasma screen TVs. Screen burn-in is when an image stays on the screen for a long period of time, and appears to get permanently burned into the screen itself. Screen burn-in can potentially happen, when running a computer presentation that has fixed blocks of solid color. However, for most plasma owners, screen burn-in will never be an issue, and you are much more likely to upgrade your Plasma TV before anything goes wrong. To put your mind at rest, most newer plasma TVs have a feature called white flash·that provides correction if screen burn-in ever occurs. There is also a calibration tool called PixelProtector that makes sure your plasma TV is always set up to combat screen burn. Very occasionally LCD and plasma TVs suffer from dead pixels when a pixel is either always on (lit up when the screen is black, for example), or the pixel is always off (black when it should have color or be white). A few dead pixels here and there are not noticeable, and manufacturers normally state that a small percentage of dead pixels are allowed. The best way to avoid any problems with dead pixels is buy a plasma screen made by a reputable manufacturer (such as Sony, Panasonic, NEC and Sharp), as the build quality of the plasma panels is higher you are less likely to have problems, and if you do, the screens will have a guarantee/warrantee enabling you to get the problem repaired or the screen exchanged. Do you have to "re-gas" Plasma TV screens? This is one of the most common, and the most wrong myths about Plasma TVs. All plasma screens are completely, permanently sealed when manufactured. Each individual pixel in a plasma panel is sealed, and therefore cannot, and does not ever require any refilling, or recharging. Next time some salesperson tells you about "re-filling" the gas in a plasma TV, ask them how long it takes to manually insert three different types of gas into every single pixel in the screen. Someone told me that Plasma TVs don't have a very long life-span, is this true? If you buy your Plasma screen from a quality brand you will get a TV with a rated lifetime of around 30,000 hours. What this means is if you watch TV for five hours, every single day it will last over 16 years. I'm guessing that you'll be looking to replace your plasma TV long before that happens, and on average most people buy a new home TV every eight years anyway! The lifetime of a plasma TV is measured by something called it's "half life" (this is the industry term for the period of time it takes for the display to appear half as bright as the day it was first used). All different types of TV screens, including LCD lose their brightness over time, but because it's so gradual, it's practically impossible to notice.